With spring on the way and more birds coming back, I am seeing more red-tailed hawks. According to the Medicine Cards: The Discovery of Power Through the Ways of Animals by Jamie Sams an d David Carson, Hawks are one of the most intriguing & mystical of the birds of prey. They are the messengers, protectors and visionaries of the air. 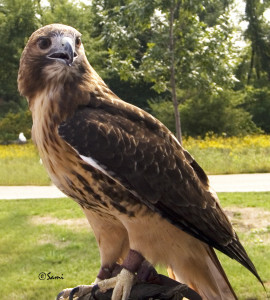 The red-tailed hawk is the messenger bird & can lead you to your life purpose. Its keynotes are visionary power and guardianship. Hawk medicine teaches you to be observant. 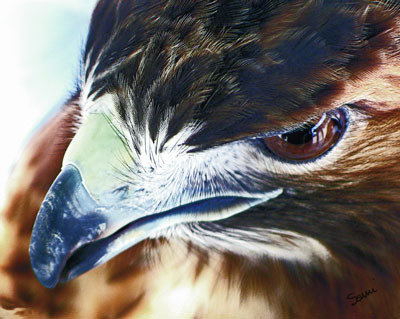 The featured image of Ostara the Red Tail Hawk was taken while she was in a cage and you can see the cage reflected in her eyes. She was being rehabilitated after being hurt. 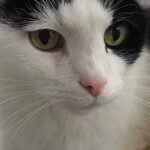 This picture, along with others, are on gift products in my cafepress shop. No bird has as much myth and mystery surrounding it than the owl. According to the Medicine Cards: The Discovery of Power Through the Ways of Animals by Jamie Sams and David Carson, it is the symbol of the feminine, the moon, & the night. Its keynote is the mystery of magic, omens, silent wisdom and vision in the night. It is the bird of magic and of prophecy and wisdom. The owl hunts at night and can not only see in the dark but can also accurately pinpoint and identify sounds. The owl has been a symbol of wisdom in many cultures because they can see that which others cannot. 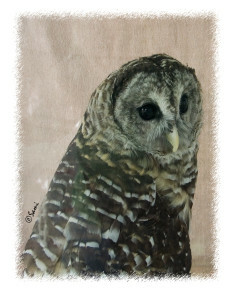 Arki the Barred Owl and Ostara were from Turtle Spring Farm Wildlife Center in Carrollton, Ohio. The Center focused on Birds of Prey & Bats. It was a non-profit sanctuary devoted to the rehabilitation & release of native Ohio Raptors & Bats, & the environmental education of the humans that share the biodiverse Earth with these creatures. Not to leave the bat out, it has been a treasured medicine of the Aztec, Toltec, Tolucan, and Mayan peoples, according to Medicine Cards: The Discovery of Power Through the Ways of Animals by Jamie Sams and David Carson. They state that, “The Bat is the symbol of rebirth.” According to batconservation.org, “bats provide a lot of positive effects on our world. From the billions of dollars they save us in pesticides, to natural pollination and seed spreading. Nine bat species found in America are listed as threatened or endangered under the Endangered Species Act. You can help save them. Adopt a bat through the Defenders of Wildlife. 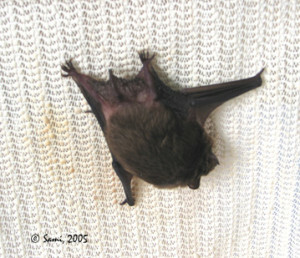 According to the Defenders of Wildlife, A single little brown bat can eat up to 1000 mosquitoes in a single hour. 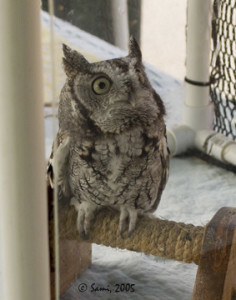 Sorcha, the Screech Owl is one of our smallest owls, measuring only 8 to 9 inches in length. They have yellow eyes and prominent eartufts which aren’t ears at all but simply elongated feathers on the top of the head. This adorable little owl makes a delightful gift on any item. 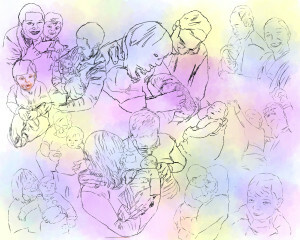 All the images are sketched and put together in the painting now and I just received the ok to start painting. I will start on the two major images in the center and then go where my imagination leads me:). We do have a missing person, Troop, their cat. I am going to place him in at the last as a surprise. The Trilogy wine painting is also taking shape. 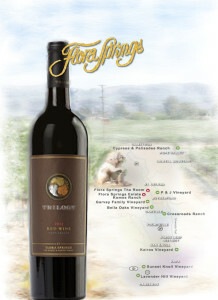 I have added a map of the area in the collage and the name “Flora Springs.” I am still playing with the wine bottle and how I want it to look and the background watercolor. But I am liking the look. Take time to enjoy the beauty around you. Let your creativity flow. Safe journeys, I’ll see you next week. This photo is incredible!!! Well done! !